Entry into confined spaces, including inspection of pressure vessels and tanks, is hazardous and costly and should be avoided where practicable. The NoMan system uses outputs from an RBI study to identify potential failure modes. Where the primary failure modes can be visually identified, the NoMan system uses high performance cameras inserted into predetermined areas of the confined space by means of a manipulator such as a carbon fibre pole. The camera has pan, zoom, tilt and integral lighting and is capable of both GVI and CVI inspections. An inspection plan ensures adequate coverage by positioning the camera to avoid ‘blind spots’ if necessary using more than one point of entry. In order to achieve a 3-D view of the space, for example to check dimensions of internal structure and fittings or structural distortion, a volume laser scan of the internal space is carried out. Preparation of the confined space for NoMan inspection is less arduous than for manned inspections, but of course the surfaces to be inspected need to be clean enough to see any potential anomalies. 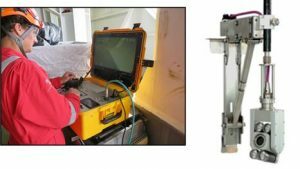 If the confined space is filled with water, the NoMan system can still use the remote camera system described above, but has a further capability which involves using a miniature ROV to carry out the close visual inspection with an option to carry an ultra-sonic thickness gauging system or other form of NDT tool.